Have you ever wondered who you are related to? Or what they looked like? I have two FREE Fill In Family History Tree With Pictures for you to choose from so you can easily see your family! If you choose the template with pictures, you begin by putting in your picture, name and birth date. Than say your mom’s picture and her name and birth date. Then your dad’s picture and his birth date. Next would be your mom’s moms picture – your grandmother’s picture and her information, and so on. 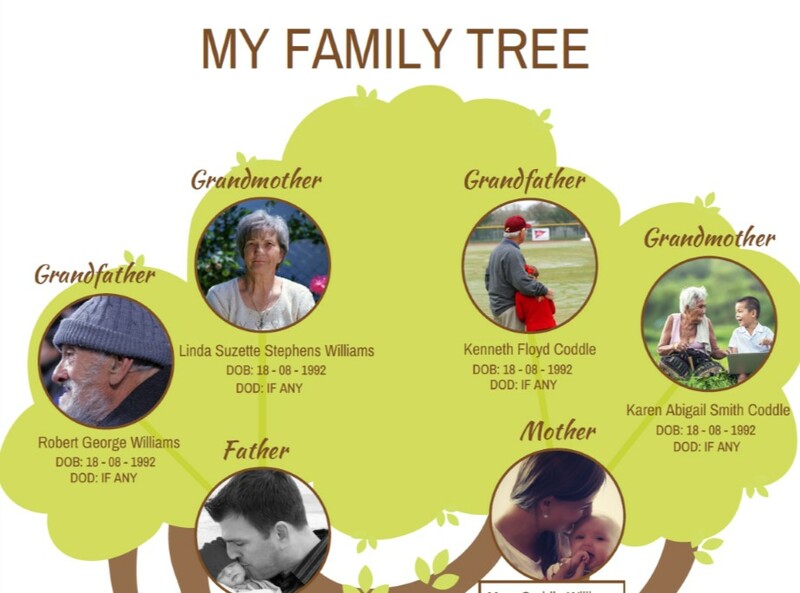 One Family Tree template includes pictures and both are Editable/Fill-In. What is the purpose of a Family Tree? Well, it helps us learn about those who are related to us in a visual way; putting people together like a puzzle with faces, dates and understanding how we are related. Do you know your grandparents? Do you know when they were born or how did they meet? What are your great-grandparents like? These are all important bits of information that add up and can help you become a better person and understand yourself more. How does it help your family? As your children understand their relationships with the present, feel a foundation in their life with the past it brings a stronger identity and more self confidence in their present life. From my own experience in doing Family History, as I looked up names and dates, I knew the people were my family. Then as I found pictures to go with the names and dates of those I didn’t know due to location, family dynamics or early death, these people now came alive to me. They were real, they weren’t just names on paper anymore, they had lives that mattered. As I talked to those family members who are still living, and finding stories as I searched, relatives became ‘my family’. Their joys, their sorrows, the highs and lows of their life were ingrained in me now in a wonderful sort of way. Just as the rings on a tree as it grows, their ‘rings’ of their life were planted in my soul because I grew to understand, love and appreciate their challenges, differences and why my life in some instances is the way it is. Some family members had made good choices that made me very proud. Some family members had made poor or even down-right bad decisions that caused problems for not only them self, but for generations after. Either way, their stories and their lives are examples to learn from. A way to see, and teach my own family that there are always consequences and rewards for the way a person decides to live their life. As I share and learn my family history, I have a stronger desire to leave an honorable legacy for those that follow, as well as those here now. I believe that is a benefit to all who start their Family History because we become more aware of our influence and the effect we have on those we love, and our posterity who are yet to be born. Doing Family History makes it very clear that our lives are incredibly important, we are loved by God, His hand is guiding our life just as He did our family members if we allow Him to and He knows us individually. The blessings and gifts that come from learning about our family members and recording their stories are unimaginable. 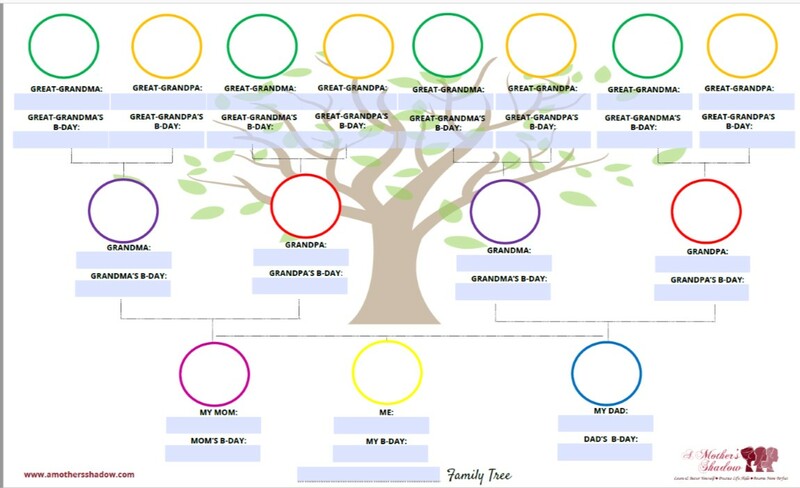 Now to choose from two different Free Family Trees that I have created for you. Each begins with the child, to the parents and then the grandparents on both sides so it isn’t overwhelming, but gets the information started and the curiosity going. Though it shows a child in the example, it is intended for any age, and every stage of life. 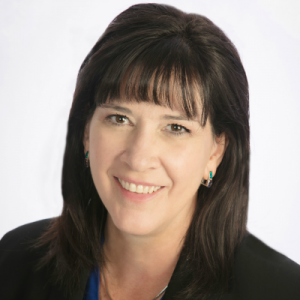 Before getting started, WHY is family history important for your kids, teens and you? Time to choose – or use both! *The link will take you to WooCommerce, which is a FREE option, just checkout and you will see all three options, choose one, two or all three to print. 1- THIS FREE TEMPLATE is editable and fill-in. Simply help your child, or do it yourself, to type in the names and dates as you find them using the editable or fill-in feature. Print it out and glue or draw in the face of the person who’s name is below the circle. This can also be printed and written on the lines, without using the editable or fill-in feature. 2- THIS FREE TEMPLATE WITH PICTURES is also editable and fill-in, done with Canva – however this project does not require a paid account. 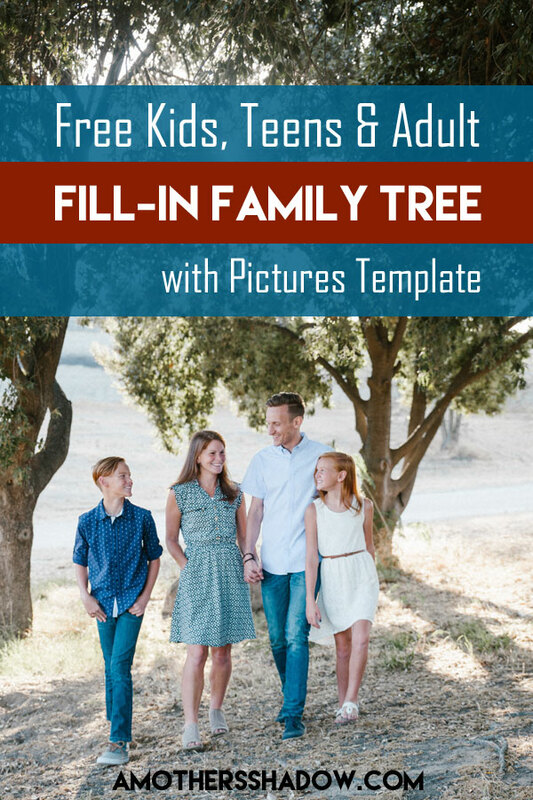 b) HERE are the very easy detailed instructions for this Free Template with Pictures, along with the Family Tree. 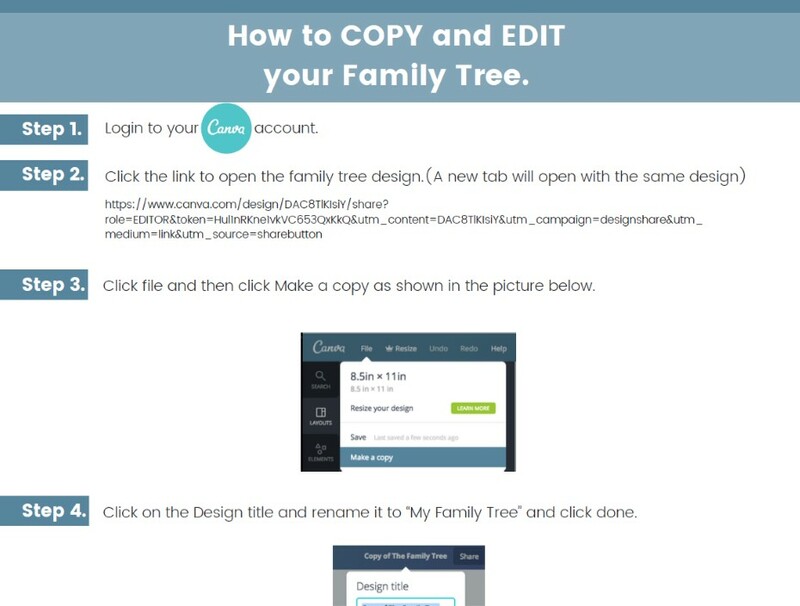 It includes step-by-step instructions and pictures so you can easily make this Family Tree. c) AND you can visit my YouTube Channel HERE where I have a video titled: Family Tree Instructional Video to walk you through these instructions! WHERE CAN I FIND INFORMATION TO HELP FILL IN MY FAMILY TREE? Type in your name and information and keep adding to the name of the nearest deceased relative. FamilySearch will do an automatic search for the deceased person to see if that person has already been added to FamilySearch. If they have been added previously, you just need to click “add”. If not, you will need to create a “new” person. Once that person’s name comes up, click on that person to see information to add to it, or see what’s there! If nothing appears then you get to start your very own Family Tree right there on Family Search if you’d like! You can read more about Family History in my first of this series: You Learn More About Yourself By Doing This! Family History is truly one of the greatest adventures of self discovery we will set out on. It will bring laughter, tears, disappointment and success. It can teach us how to overcome trials and failures, while learning to leave an honorable legacy as we understand the pitfalls and righteous decisions of those who came before.